The Fedora community took almost a year for developing and releasing the version 21. Though I am not exactly clear of the exact reasons for this delay, after using the default Gnome 3 spin for a couple of days, I must say ‘the wait’ was worth waiting for, after all, “all good things take time”. However, first it is worth noting that I have an immense respect for the Gnome desktop developers for they have mastered some aspects of the art of simple, intuitive & lightweight software design, though, because they have little regard for what the end-users have to say, in their arrogance, have over simplified things and rendered it, from a certain outlook, useless (this is my opinion only). But as proven by Nature, the successful counterbalance for such ignorance is usually acquired through the act of intervention by a higher force. 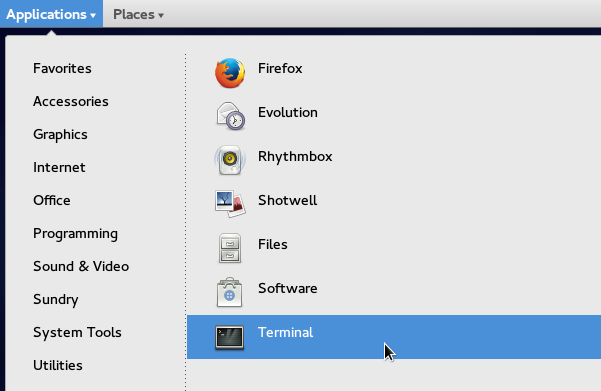 And luckily for end-users like me, RedHat intervened (a while ago) and demanded that they develop a desktop interface that is similar to the old ‘Gnome Classic’. And so they did, and not that it fixed all the over simplifications of individual applications, I consider it to be reasonably enough, enough to the extent where I could at least consider using it (again, I can only speak for myself). As a result, from day one under my newly installed Fedora 21, I have been using the ‘GNOME Classic’ desktop session, and I must say that most of my frustrations of GnomeShell are now gone and I am quite enjoying it. As far as the software versions are considered, Fedora 21 ships with the Kernel 3.17.4-301,systemd 217, X.Org 1.16.1, GnomeShell 3.14.2, Firefox 33.1, LibreOffice 4.3.2.2.0, Evolution 3.12.8, Shotwell 0.20.2, Empathy 3.12.7 and Transmission 2.84, mainly. 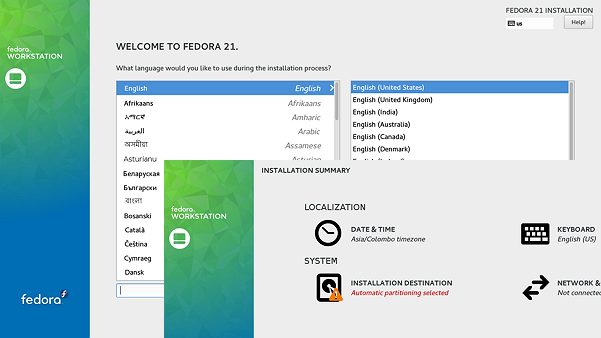 With this release, Fedora comes in three different flavors, names of which speak for themselves: Server, Workstation & Cloud. This review of Fedora 21 will be based on the 64-bit Workstation flavor. As usual, I will present to you the performance related details of Fedora 21 too, and decided to use Ubuntu 14.10 for the comparison, because my previous Fedora review is based on the version 19, which is a bit ‘old’, though, I will mention its data where I see fit. As always, I measured the performance related details (I took five samples of each test) before making any tweaks, though they are presented, starting at the middle of the article. Below is a briefed summary of the hardware on which I tested it. I criticized the Fedora 19’s installer for its lack of ‘progressive steps’, where rather than presenting the user with the ability to make one choice/change at a time and then move on to the next, one is constantly forced to go back and forth for setting things up. Considering the disk selection & partition setup as an example, such UI design might even put data of an inexperienced user at risk, due to its confusing nature. Sadly though, it is pretty much the same in Fedora 21. On the bright side of things, there are however a couple of subtle improvements. The installer (‘Anaconda’) now displays a Fedora logo which adds an element of professionalism and takes away the slight immature look that it had. The buttons too now look sharp and neat. Fedora 19 installer also had this issue where if you accidentally un-maximized it (say by dragging it down), then it failed to go into the original maximized mode which forced the user to vigorously use the scroll-bars for accessing the buttons due to its new smaller size. This too is seemed to be fixed. There was no option to make the default user login automatically (a security measure perhaps), but you can enable it through the user-management GUI, once installed. Other than that, till the end, the installer carried out its job without any issues. Unlike in the past, you won’t get any fancy looking GRUB theme with Fedora anymore. It is a combination of Black & White and, well, that’s it! 🙂 . The boot logo is the same as before (I apologize for not being able to provide a screenshot. I tried to capture it using ‘plymouth’ daemon, but ran into some issues). As mentioned, from the very beginning I decided use ‘GNOME Classic’ session. Once logged in, I was greeted with a familiar looking desktop layout, though I will not waste your time by exposing each individual feature, because I am confident that almost everyone is familiar with it. However, I could not add icons to the Top Panel (as under the old ‘Gnome Classic’ desktop) and I miss that feature a lot. I have not been using the new version of ‘GNOME Classic’ that much in the past (I will though in the future! ), but in earlier versions you could do it by clicking an application icon while pressing the ‘Alt’ key. But, through the ‘Activities Overview’ window, you can right-click on an icon and choose ‘Add to Favorites’, and it will then be displayed under the ‘Favorite’ section of the ‘Applications’ menu, not on Top Panel still. Fedora does not ship any proprietary software (multimedia codecs & Adobe Flash included), nor it even offers them through its official repositories. This forces one to make a few additional changes before they can unlock the full potential of the OS, but, Fedora has always stick to its principles, and I carry a prestige respect for that. In a world full of deceivers & opportunists, rare it is those that take confidence in their principles. Bravo! . Do not let your heart be troubled if you are a newborn to GNU/Linux, for you can easily resolve that by simply following the guidelines laid-out in third-party repositories such as ‘RPM Fusion‘ & the official online help portal: ‘Ask Fedora‘. After installing the necessities, ‘Totem’ was able to play all my proprietary multimedia files (which is mostly what all there is 😀 ), although it struggled with the frame-rate while playing a certain AVI file (it played other AVIs just as one would expect it to). The Adobe flash playback has so far being excellent. Fedora by default include a utility (‘framework’ is the more fitting definition methinks) that runs from the background and downloads and installs updates automatically, when it sees fit. This is an excellent approach for those that have the luxury of having an unlimited Internet access, but for others that do not, it can be a bit of a headache, mainly because the way it is designed, it renders very little output (none at all actually) to the user, when performing its humble commitment. 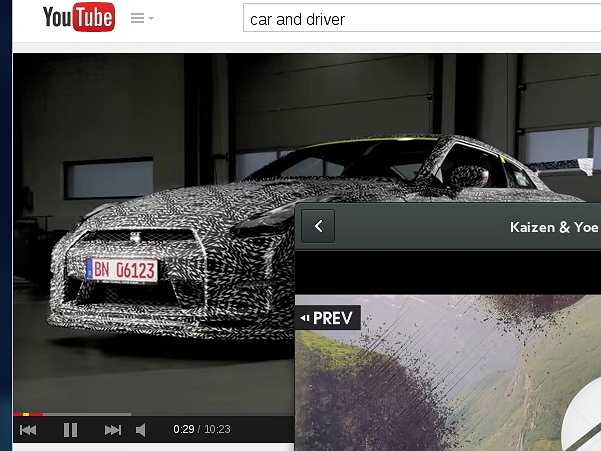 As an example: While browsing the web, I suddenly felt a lag of responsiveness from the browser. So I opened-up the System Monitor and noticed that even when the browser was not requesting webpages or downloading files, something else was lavishly consuming my network’s bandwidth. A closer look conformed that this ‘something else’ was none other than the ‘PackageKit’ daemon (‘packagekitd’). Being aware of what it was, I waited greedily looking at the network usage , a few minutes went by and the usage readings were now set around 180MiB and ‘packagekitd’ was still at it. After another few minutes the usage readings were now set around 230MiB at which point I started to grow quite impatient. I am sorry to brag, change my usual writing style, and drag you alone for exposing such a small detail, but I thought it would be good for breaking the chain of boredom 🙂 . Enough bragging, below are the performance related data that I gathered. Note: Just as I do on all other reviews, I had enabled the user auto-login feature prior to this test. As shown in the above graph, when compared to Ubuntu 14.10, Fedora 21 was roughly 7.4% slower to boot. 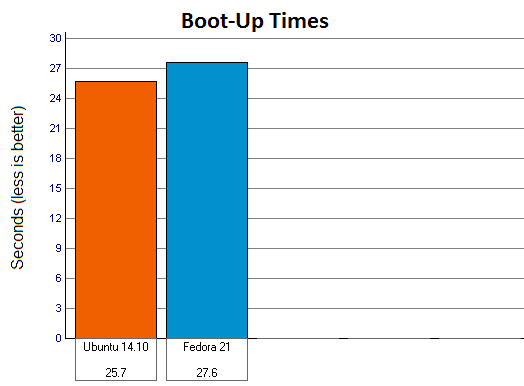 However, in contrast to the older Fedora 19, Fedora 21 boots 9.2% faster. 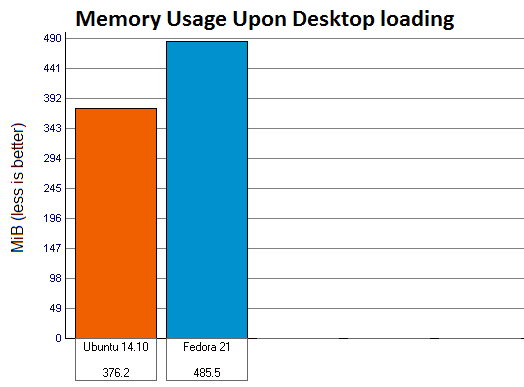 Fedora 21 ‘GNOME Classic’ at its initial desktop loading (without manually executing user-programs) used 29.1% more memory. When compared to Fedora 19 (using the ‘GnomeShell’ though, not ‘GNOME Classic’), Fedora used 16.5% more memory, yet, it was able to boot faster than Fedora 19, which is not a surprising fact as the memory usage is merely a single factor that affects the boot-up times. I have witnessed (for a long time) Gnome System Monitor process itself consuming about 6-7% (including Fedora 19) from the CPU, when let to idle. But the one in Fedora 21 only used about 2% and (even zero usage, though, rarely & only for a second or a two) other processes such as ‘gnomeshell’ did intervene here and there, but most of the time, they let the CPU idle, which is exactly how it should be. 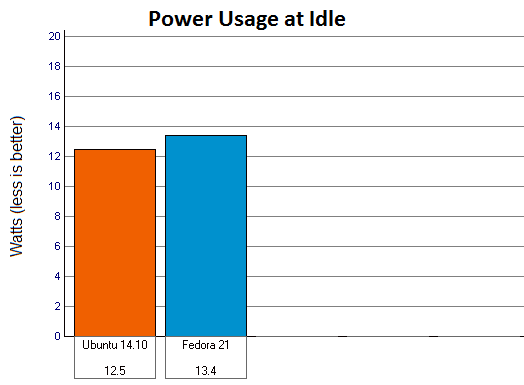 Fedora 21 did not excel in terms of power consumption either (used about 7.2% more compared to Ubuntu 14.10). There is a native Fedora utility called ‘tuned’ which lets you tune Fedora through various ‘presets’. So I installed it manually and applied the ‘powersave’ profile and remeasured the power usage. As you see, it was able to reduce about 0.7 Watts (5.2%) which was not bad as far as power consumption was considered, but I am sure had I used other utilities such as ‘TLP’, I could have brought it down a bit more. Nonetheless, as far as the in-house-optimizations were contemplated, I was a little disappointed. P.S: When measuring power consumption, I disabled the screen from being dimmed & blanked and set the brightness level to its maximum, turned Wi-Fi ON (connected to my Wi-Fi router), Bluetooth OFF and let the system idle. This is what I have done in all other reviews. Fedora 21 recognized & configured my hardware devices really well. It did not, unlike in most other GNU/Linux distributions, reset my brightness level or turned the Bluetooth adapter ON on each desktop login and was able to restore them to their previous states. Suspending and waking-up worked like a charm too. When plugging in the AC adapter & when the battery acquires its fully charged state, the screen brightness gets reduced to its lowest level. But as soon as I press the keyboard combination once, for increasing it, it suddenly jumps slightly above the previous value (the value before the brightness got reduced). This is not unique to Fedora 21 as I have come across this issue some other distributions as well. So, except for this minor issue, I must say that I am mightily satisfied with Fedora 21 as far as the hardware & the ACPI configurations are considered. My usual system responsiveness test consists of trying to open multiple programs such as LibreOffice Writer, Firefox, Terminal emulator, Shotwell, System Monitor, searching for applications in the ‘Activities Overview’ window and including an attempt to play a multimedia file, while a reasonably large file (about 1.5GB) being copied within the ‘Home’ folder of the currently logged-in user. So how satisfactory was it? Most of the applications got opened-up before the file copying finished, but the mouse pointer sensitivity got lost couple of times (for a second or two at each instance) and the video playback too was interrupted few times. It certainly was not the exceptionally responsive Gnome desktop I used to recall, and when compared, I think Fedora 19 performed a bit better as well. That said, would it be enough to drive me away from it? Absolutely not!. My judgment is that it was decent. Not exceptional, but decent. 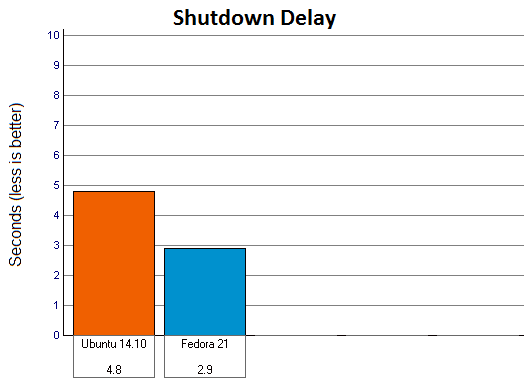 Fedora 21 was able to shutdown 39.6% faster compared to Ubuntu 14.10 (46.3% compared to Fedora 19). Not just while running this test on a freshly installed OS, but while using it for the past couple of days freely, even if I had opened-up a couple of applications, the shutdown speeds were quite nimble, very impressive. 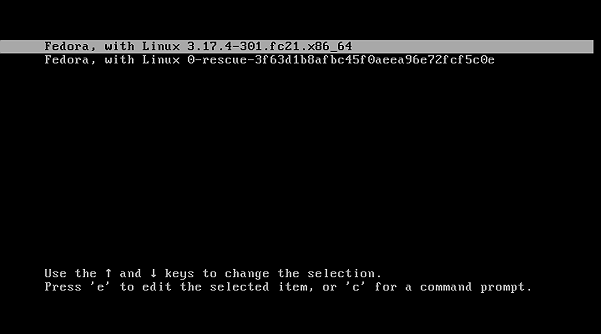 My experience with ‘GNOME Classic’ under Fedora 21 has so far been wonderful. Although the system responsiveness was slightly disappointing, inevitably, the faster boot-up times, low memory usage, stability and the whole desktop experience, balanced it out at the end. If you are a Fedora and a Gnome 3 admirer, then my humble advice is that you must try it!. But kindly keep in mind that depending on your hardware setup (say if you have an Nvidia or AMD GPU for instance) there could be bugs that can affect your installation. So please take a few minutes and read the ‘common bugs’ page first. Once done, head over to this page for downloading it. Thank you for reading. ‘Gnome Fallback Session’ was introduced not with the initial release but with a latter one, and it was back then introduced as a ‘fallback’ and without 3D rendering, as you accurately put. However, as someone with a reasonably long experience with GNU/Linux (almost 12 years now), with Gnome there has never been ‘alternatives’. They always had a mindset of ‘take it or leave it!’, & the end-users were almost always at the mercy of ‘their vision’ (take the transition from GNOME 1+ to GNOME 2 for instance. It included radical changes which received a lots criticisms, yet there were no alternatives). Yet, this time, after introducing the totally revamped GnomeShell (the transition from GNOME 2+ to GNOME 3), ‘Fallback session’ came along shortly, and rather than abandoning it after GnomeShell matured, after as far as the version 3.8 (if I’m not mistaken) they even added 3D rendering support to it. Although the ‘GNOME Classic’ resembles the old UI concepts from which they are quite vigorously trying to get away, it’s still developed to this day, and that tells a lot. Now I’m no expert on GNOME, but ‘GNOME Classic’ is the default desktop used in RedHat Enterprise Linux 7+(though that might change in the future). So, I made my judgment from my own experience and it’s my opinion only, and I could be wrong of course (‘Linus’ has also made similar comments about the mindset of the GNOME developers I recall). Coming to the other criticism: I used Ubuntu in the comparison for the mere reason of both Fedora and Ubuntu being rivals, period. im a ubuntu user,but decide test fedora for first time! only test…i think fedora is not good for beginers. Thank you for taking the time to write such a thorough review. I have not done the update yet, in recent years I have waited for those kind souls – such as yourself – that test and report; so thanks. I will again use the fedup approach to upgrade, which has worked very well in recent releases. Like you, I have tried GNOME 3 several times, but since GNOME 3 came out I have switched and stuck with XFCE. Other than my kids, I don’t personally know anyone still using GNOME 3. I didn’t understand the rant above about comparing to Ubuntu, I was interested, so thanks for that as well (get a solid state drive and those times will go down). You’re welcome Roger, and good luck! 🙂 . Hi Gayan, what a great review you did! I never used Fedora, or ever had the wish to do so (I’m a Ubuntu user), but I’m very interested in all of yours reviews. They are always so well performed and very accurate, but still qualitative and even personal and this accounts a lot to allow the reader to construct its own critic. Please, keep doing this great work, because I’ll keep tracking your articles. Thank you very much Paulo! 🙂 . But nice review. Could be more technical for my taste. Fedora primarily targets developers of all kinds. With this Project in mind https://www.indiegogo.com/projects/builder-an-ide-of-our-gnome Fedora could become the best development distro out there in near future. I want to add that I’ve used Fedora 21 for playing Counter Strike Source on my Lenovo T420s (8GB RAM) and it was the best experience if I compare it with playing CSS on Ubuntu 14.04 or 14.10. On Fedora it went really smooth. On Ubuntu 14.10 it lagged a very little bit and on Ubuntu 14.04 it lagged the most. Just like on Win8.1 on this machine (yes I did that many installations of steam and CSS). I’ve used Fedora 21 with Gnome 3 and hated it each day more and more. Additionally the responsiveness of Gnome 3 felt laggy after I had multiple windows open. It really feels overanimated. 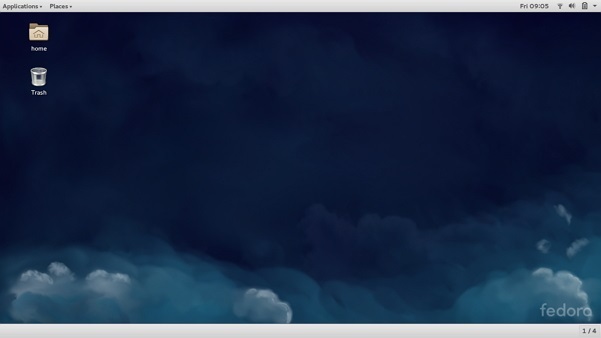 But luckily one can easily turn some animations of with the gnome tweak tool. I do agree that my reviews are a little drifted toward technicality and are slightly out of the taste of the everyday user, which is why there aren’t that many comments.